Though I like and cook a variety of foods, I often fall into a breakfast rut: whole-wheat toast with almond butter. Recently, to shake it up, I decided to try my hand at muesli — a combination of grains and dried fruit mixed with yogurt — which takes minimal effort to pull together. Muesli makes a filling and tasty breakfast, a pleasing new alternative to my weekday mornings. For each serving, place ½ cup yogurt in a cereal bowl. Add a quarter-cup of water, and honey or maple syrup to taste. Stir until smooth. Add ½ cup of the muesli, stir, then let sit at least an hour or overnight in the fridge. 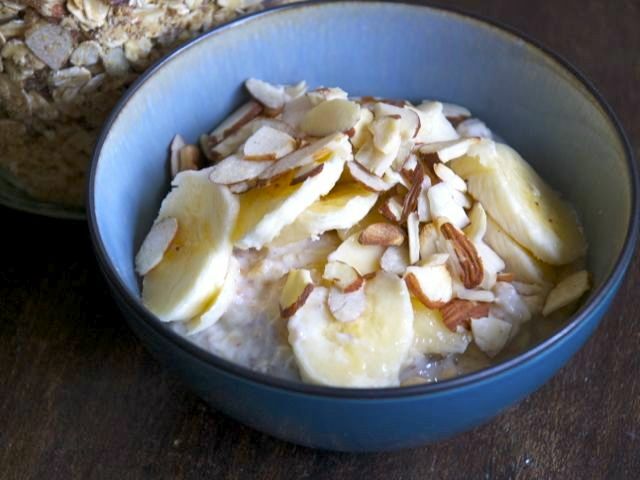 Serve with the sliced banana, if using, and a small handful of the remaining toasted almonds.